The UT-60D U-wing gunship revealed in Rogue One (out digitally today and on disc next Tuesday) has inspired numerous LEGO models, from the official 75155 U-wing Fighter set to fan-made creations like the UCS U-wing by Mirko Soppelsa. 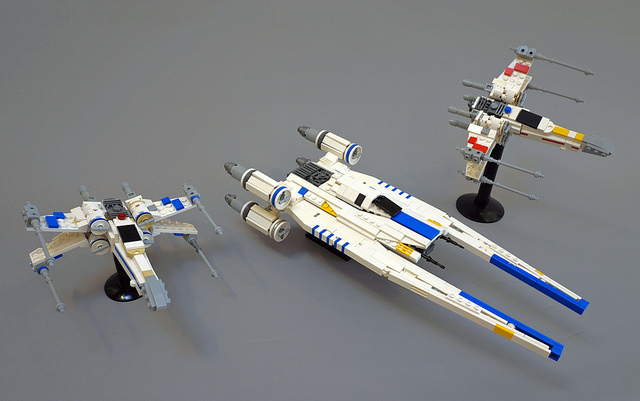 Adding to his fleet of smaller-scale LEGO Star Wars vehicles, Tim Goddard has built a fantastically detailed U-wing, accompanied by a pair of updated X-wings representing Blue Squadron and Red Squadron. Like the short-lived 7778 Midi-Scale Millennium Falcon, this scale gives Tim enough pieces to achieve lots of interesting detail (I love the gray section and those blue stripes on the sides of the U-wing) without a huge investment in parts. Naturally, Tim has built fully functional swing-wings for his U-wing. 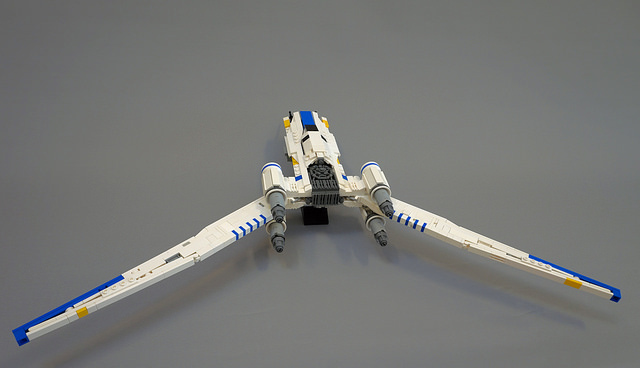 Are there instructions anywhere to build the smaller U-wing?